Recently, the issue of levibility of Service Tax on reimbursements on electricity expenses received from the occupants of a complex came before a Single Member Bench of the Hon’ble Calcutta High Court, wherein the Hon’ble High Court has upheld the levy of Service Tax on such transactions. [Srijan Realty (P) Ltd. v/s Commissioner of Service Tax, Service Tax Commissionerate II - Kolkata & Ors. W.P. No. 770 of 2015]. · The petitioner has a commercial complex developed and operated under the name and style of “Galaxy Mall” lying and situated at Asansol. The Commercial Complex has various occupants. · In order to effect electric supply to the commercial complex, the petitioner entered into an agreement on October 26, 2010 with DPSC Ltd. (now known as Indian Power Corporation Ltd.). · Such licensee provides electric supply through an 11KV substation installed at the commercial premises. The licensee raises a single consolidated electricity bill upon the petitioner. · The petitioner on receipt of electric supply, redistributes the same to the occupiers of the commercial complex. The petitioner has installed sub- meters for the respective occupiers. Based on the readings of such sub-meters, the petitioner raises bills upon such occupiers. · The petitioner initially collected Service Tax. However, upon objections being raised by the some of the occupiers, the petitioner consulted the Superintendent of Service Tax, ST II Commissionerate for determining whether such redistribution of electricity was exigible to Service Tax under the Finance Act or not. · The Superintendent of Service Tax held the view that, such a service is exigible to Service Tax. The petitioner had obtained legal advice which was of a contrary view than the Superintendent of Service Tax. · Thereafter, the petitioner by its letter dated January 30, 2015 intimated the Department that, it was not liable to pay Service Tax. 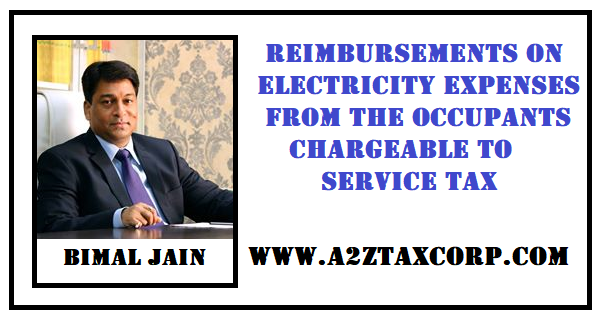 · The Assistant Commissioner of Service Tax, by a letter dated March 27, 2015, held the view that, the redistribution of electricity by the petitioner was eligible to Service Tax. Ø The petitioner does not have a licence to undertake trading in electricity under Section 12 of the Electricity Act, 2003. The petitioner also cannot be said to be engaged in the business of transmission as, the petitioner does not have such a licence. The petitioner is not a person authorized to transmit, supply, distribute or undertake trading in electricity. Ø Any other interpretation will render the steps taken by the petitioner in receiving high-tension electric supply and making over low-tension electric supply to the occupants, violative of the provisions of the Electricity Act, 2003. Ø Service is defined in Section 65B (44) of the Finance Act, as an activity carried out by a person for another for consideration and includes a declared service. The activity of the petitioner comes within the definition of service. The activity of the petitioner sought to be made exigible to tax does not come within exclusions contained in Section 65B (44). Ø The transaction of the petitioner obtaining high-tension electric supply converting it to low-tension supply, and supplying it to the occupants, raising bills on such occupants and realizing the electricity consumption charges from such occupants, is a service which the petitioner renders, and such an activity is exigible to Service Tax under the Finance Act. In light of the judgment of Hon’ble Supreme Court in the case of Union of India v/s Intercontinental Consultants & Technocrats Pt. Ltd. reported in 2018 (10) GSTL 401 (SC), wherein, it has been mandated the Rule 5(1) of the Service Tax (Determination of Value) Rules, 2006, to be ultra-vires for the period from May 1, 2006 to May 14, 2015 (“Impugned Period”) and held that only the gross amount charged against such services by the service provider ‘for such service’ and the valuation of service cannot be anything more or less than the consideration paid as quid pro qua for rendering such a service.